Looking at woody biomass-to-energy conversion from a different angle. Biomass is virtually everything that is plant-like, from trees in the forest to plankton in the ocean and all could potentially be sources of useful energy. However, when speaking of biomass-to-energy, what comes to mind is energy extraction from woody biomass or from farm crops, like corn or oil-rich rapeseed. The collected or harvested biomass intended for energy extraction is considered a fuel. As with any fuel, manmade or not, when consumed for practical applications, such as for conversion into electricity, or to power an automobile, the objective is to minimize the amount of fuel used for maximum output of whatever the design goal is, and hopefully in an environmentally acceptable way. The design goal is efficiency or minimization of losses, the parasitic losses that are inherent in any scheme that changes energy from one state to another. In the end, it is the cost of the fuel, or energy, to the consumer that makes some solutions succeed and others fall by the wayside. All renewable energy must compete in the marketplace with hydrocarbon fuels; petroleum, natural gas and coal are extremely low in price today. In the long run, all the noble intentions to intervene with or reverse global warming fail, if the cost of the measures adversely impacts the consumer’s pocket book. Look at the December 2018 “Yellow Jacket Revolts” in France, with the government forcing measures to curb emissions by taxing citizens for using certain fuels. Looking at the biomass that is abundantly available for energy extraction, we will find that almost all of it is woody biomass, trees killed from pests, drought or wildfires, forest slash derived from harvest operations and forest thinning, wood waste from crop rotation and fruit tree trimmings in agriculture, and waste from residential curbside green waste collection, land clearing. In short, we have an overabundance of woody biomass fuel or waste. Only a small amount of that waste is recycled. The U.S. EPA reports that in 2015 wood waste and yard trimmings combined were 51.02 million tons, and of that 21.86 million tons ended up in landfills. Wood waste accumulated from forest management, wildfire rehabilitation and natural disaster is not included in the EPA assessment published in 2018. What does this mean? With extremely low hydrocarbon fuel prices, oil, natural gas and coal, energy, such as electricity from biomass, must compete with those low prevailing prices. In short, in most parts of the industrialized world, we do not have an energy shortage; to the contrary, we do have a serious vegetative or wood waste disposal problem. Using wood waste sparingly to turn it into energy is counterproductive and the amount composted and converted to commercially useful mulch is small. 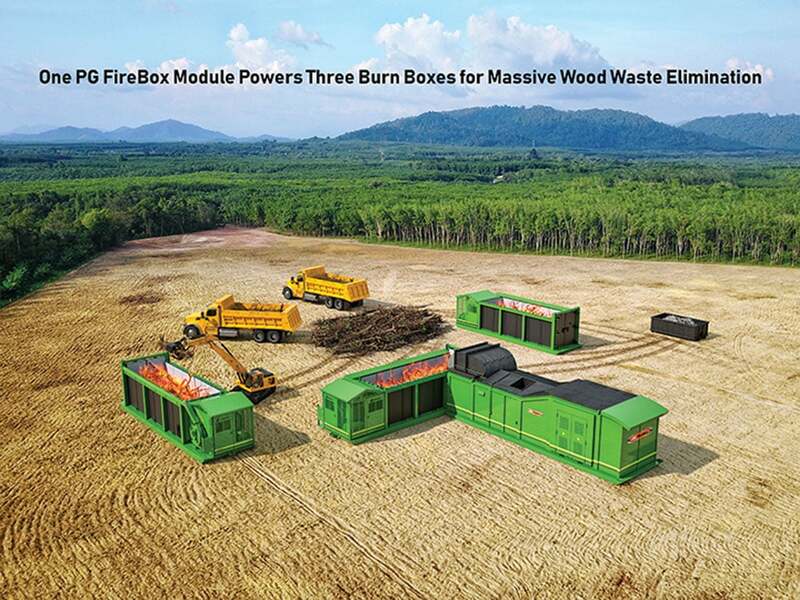 What we need are biomass waste-to-energy conversion systems that first and foremost eliminate the massive amounts of wood waste with which we are confronted, and simultaneously extract as much energy from the biomass as possible, both thermal and electric. Biomass dumped into a landfill reduces the life of it, and releases methane (a very bad climate change forcing agent) from the decomposition process and possibly leachates that could be polluting the water table from which drinking water is drawn. • The systems are bound to a brick and mortar plant, except for a few very small non-industrial units. • The systems cannot be relocated, when the near biomass source dries up earlier or later, say within a plausible 50-mile radius. • The obligatory connected machines, the grinders and trucks are costly, use hydrocarbon fuels, pollute and can be a burden on the roadways. • Waste elimination is not rapidly achieved, and the biomass conversion is selective, as root balls and any other biomass (say from dead trees) may be unsuitable for pre-processing. • The system is designed to use biomass waste sparingly for maximum energy extraction to reduce the high cost of pre-processing, including trucking. • Machines can be deployed to where the biomass is generated or collected, and not the other way around, as is the case with all brick-and-mortar systems. • They are environmentally friendly—even for use in strict regulatory compliance regions, like California. • The systems do not require any pre-processing of the waste, such as costly and polluting grinding. • The machines are simple to operate and durable for a long useful life. • The machines are affordable—an installed system should cost less than a large grinder. Portable air curtain boxes come with air-blast cooling modules, though cooling water from a well or large lake is always a good alternative where available. All systems can be torn down easily for relocation closer to the source of biomass waste. Their installed cost is so reasonable that in most placements, the systems pay for themselves in a matter of months or just a few years. That is plausible, because the process encompasses total waste elimination and the avoidance cost of tipping fees or other disposal cost and the associated transportation and grinding costs add up quickly. Since much of the biomass waste that requires elimination is in the forest, either from dead trees killed from pests, fires or drought, it would make the most sense to place a portable air curtain box onto a landing in the forest. It could power ancillary equipment, like electric loaders of feller-bunchers. This would bring us a step closer to the Electric Forest1, especially with larger stacks of lithium batteries becoming affordable. At a saw mill or landfill, a portable air curtain box would power machines like kiln dryers, gravel dryers, sorting lines, heat buildings, etc., and, of course, always power itself—all from the waste it eliminates. This is referred to as Closed-Circle-Recycling. In the larger scheme of things, future portable air curtain boxes will find their place in plans for distributed power at communities and military bases where the objective is to lessen the reliance on mega powerplants with vulnerabilities to natural disasters and terrorist maleficence. Because the system can be powered by wood waste that is usually available overabundantly in the wake of natural disasters, and because no external energy and biomass pre-processing is required, these machines are expected to take a major place in the arsenal of equipment specified for disaster recovery operations and to meet renewable energy mandates with the Military and public installations in general. To foster such use, a portable air curtain box will provide the basis to earn landfill diversion credits in many regions, such as in California, a valuable commodity for many authorities to stay on track with government mandated goals to keep biomass out of landfills and to benefit from related tax credits and government subsidies. 1. Conceived by Air Burners.